Jojoba oil isn't really an oil at all -- it's actually a type of liquid wax. The substance is very similar to oil in human skin, also called sebum. It may seem counterintuitive to smear oil on your face, especially if you're prone to breakouts, but jojoba might actually make greasy skin better. Jojoba oil moisturizes skin all day, so it's ideal for dry faces, too. Jojoba is very mild, and you can apply it directly to your face. It also mixes well with other oils, such as grapeseed or tea tree oil. Apply the oil directly to your face by moistening your fingers with a few drops. Gently rub the oil into your face and neck using small, circular motions. Don't rinse. Use no more than six drops of undiluted oil at a time -- more than that can make skin look greasy. Add jojoba oil to your daily moisturizer. 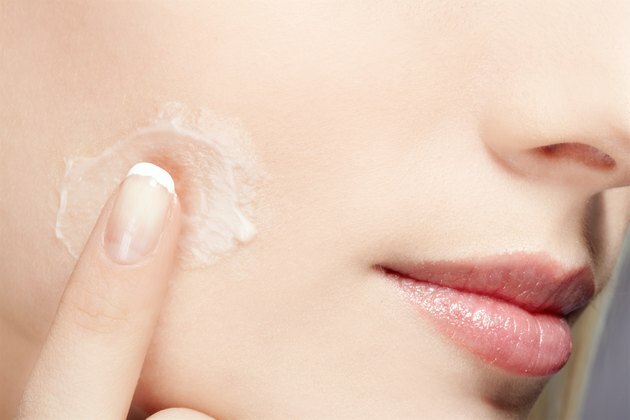 Include just three drops of the oil to quarter-sized amount of moisturizer in the palm of your hand, then smooth the moisturizer over your face as usual. Combine jojoba oil with aromatic essential oils to treat oily or acne-prone skin. Add 2 ounces of jojoba oil to a small bottle, then add 10 drops of rosemary essential oil and 15 drops of tea tree essential oil. Put a lid on the bottle and shake it gently. Smooth a few drops of the oil mixture over your forehead, nose, cheeks and chin. Let the oil soak in for a minute, then moisten a cotton pad with witch hazel. Wipe your face with the pad. Combine oils with Vitamin E for a nourishing skin treatment. Mix 1 ounce of jojoba oil and 1 ounce of grapeseed oil in a small bowl. Break open a vitamin E capsule and add the contents to the bowl. Add several drops each of neroli and lavender essential oils. Blend the oils well, then apply the mixture to clean skin. Prepare a mixture with ingredients that will shield your skin from the sun. Combine 1/2 cup of jojoba oil and 1/2 cup of coconut oil in a small bowl. Add 2 tablespoons of titanium oxide and 1/4 cup of zinc oxide. Stir well. Smooth the mixture over your face and other skin about 20 minutes before heading outdoors. Look for essential oils and oxides at a drugstore or the cosmetics section of a health-food store. Rub a few drops of jojoba oil on dry lips as a moisturizing lip balm, or mix a bit of oil with your conditioner for shiny, soft hair.